So if you are just graduating from college one of the words you probably get chills from is debt: college debt, credit card debt, car and house debt. Debt has become such a taboo word for us that I feel that many of us would rather just ignore that bad word rather than talk about it, and find ways to get a hold of it. My favorite way to establish good habits is with mobile apps and I have a list of my favorite ones on my phone right now! If you do not have a Paypal account, I highly recommend getting one. Paypal is kind of like an online bank and it’s a safe way to purchase on websites that you do not feel most comfortable sharing your credit card info with. They are also really good for sending money to family and friends. All you need is the email address they use for their paypal account and you can send them cash! My favorite element of this mobile app, and also the reason why its on a budgeting app list is because it acts almost like a bank account. In my case, a bank account I do not use very often. This is a great place to add your budgeted spending money to as long as you get a paypal debit card. Then you will be good to go! So for those of you who have been told the lie that you have to pay a monthly subscription to get your credit report, I have news for you…you don’t! Credit Karma lets you see your credit score for free year round and will notify you when it increases and decreases. If you are trying to keep an eye on your credit score, this is an awesome app to have. Mint.com is by far my favorite finance app. This cool app lets you plug in all of your bank account, debts, credit cards, etc. and lets you see it all in one place. What makes this so cool in an app is that alerts you whenever you get any fees on your cards, or if you go over any of your budgets in a given category. My favorite feature of this app is your ability to set goals. Trying to plan for that vacation next year? Just set a goal as “vacation” and link it to an account that will be dedicated to saving for that event alone. Mint.com keeps track for you and also lets you know when you should reach your goal, based on the amount you add each month. A really nifty app, with an easy to understand interface. The learnvest app is very similar to the mint.com app. I like their interface more than Mint.com’s, however, it can be a little complex inputting all the accounts and budgeting. But, once you get over this hurdle, it is much easier. 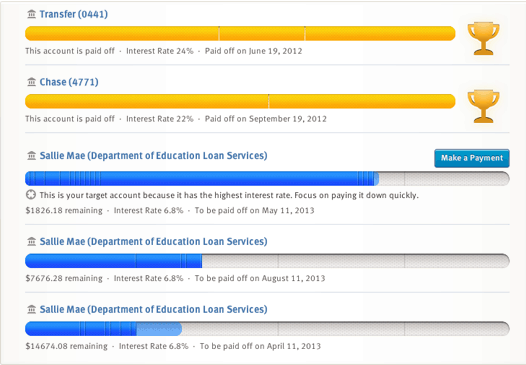 There are several boot camps on Learnvest that I adore from saving for a big event to getting out of debt. They have a great service and paid options too if you’re interested. This app is really useful and has a clean user interface. So are you ready for the ultimate app in getting out of debt? Ready for zero is a game changer. This nifty little app allows you to add all your debt accounts. This can be from credit card debt to student loan debt and what they do is tell you how much you are paying in interest every day. This app has opened my eyes to how much damage a little credit card debt can do, you literally pay for it. What’s really cool is if you add in all your debt, it will go through to see which accounts have the higher interest rate and has you focus on paying that account off first to prevent paying so much daily interest. I LOVE this app. Download it today you will not regret it. Thanks for commenting! And it really is a great tool. I will reach out if I need anything!